This is the ThruNite Neutron 2C V3 (newest version) sent to me for review from ThruNite and NO other compensation other than keeping the light. I know I am posting this a little late for Christmas to get the light for anyone who may want it by then , but I have had a number of things cut into the time I could spend getting the review finished with the holidays coming up and just everyday life , so my apologies for not getting this posted sooner. I will start by saying the Neutron 2c V3 is a very nice light from the time you get it out of the box , as it just has the look and feel of a quality light , which I have come to expect with the ThruNite products. The package comes with the instruction manual and thank you card , the ThruNite 3400mAh cell , USB charging cable , 2 extra USB port covers , 2 extra O-rings , an extra rubber boot that goes under the side switch and detachable clip. This latest upgraded model has the XP-L V6 emitter in it and comes in a cool or neutral white. The emitter is well centered inside the somewhat deep reflector (for a tube style light) and the reflector itself looks pretty much flawless. The lens is AR coated and the Anodizing is very well done. The knurling is somewhat aggressive , but not overly so and has a really good feel to it with alot of grip. The threads are square cut , well machined and were lubed just about right when I received the light. The Neutron is also USB side port rechargeable , or you can remove the cell and charge it on an external charger if desired. The USB charging is rated at 1 amp. With the tube extension in place (or removed) The light can be used with a single 18650 , 2 × 16340 or 2 x CR123A , single 18350 or single 16340. This makes the light compatible for a number of different configurations and cells , so to me that is very big plus. The indicator light also functions when using the USB side charging port. When the cell is depleted the light will be Red when you start charging and turns Blue when the cell is fully charged. If the cell is inserted wrong or if there is not a good connection , such as the tubes not screwed together good or a bad contact , then the indicator light will show Purple. The driver seems to be a constant current driver that is used , but at this time I do not want to try to get the light apart and risk damage to check it , as it seems to be glued tight. The UI is my favorite feature of this new model. It has what ThruNite calls “Infinity Modes” , most of us know it as Ramping. The ramping is used by simply turning the light on with a single quick press , then to go up or down you simply hold the side switch until the desired brightness level wanted is reached. If you are going higher in brightness and stop then then next press will go back down or if you are already going down and stop , the next press will go back up in brightness. You can achieve any level of brightness desired with this firmware , so there is always the perfect level of brightness. The ramping does move a little slower than some I have seen , such as the “Narsil” , but it does give you a little more reaction time when trying to fine tune the brightness. There is also memory , so no matter what level of brightness you are at when the light is turned off that is the level it will come back on in throughout the “infinity” or ramping mode and that level stays in memory even if you go into Turbo , Strobe or Moon. The Turbo , Strobe and Moon mode are not memorized. The Moon mode is activated with a long press from off , the Turbo is a quick double click (from any mode including off) and the strobe is another quick double click from there , a single quick press to turn the light back off. The beam pattern on the Neutron is a semi throwy beam but with some good coverage area also. The tint I am reviewing is listed as “cool” but it is not like the really cool , blueish color that we normally associate with cool , the tint is more of a pure white to my eyes. The light should have some good runtimes with a high capacity 18650 for sure. Due to so much going on right now with getting ready for the holidays time constraints kind of kept me from doing more run time testing than I did. 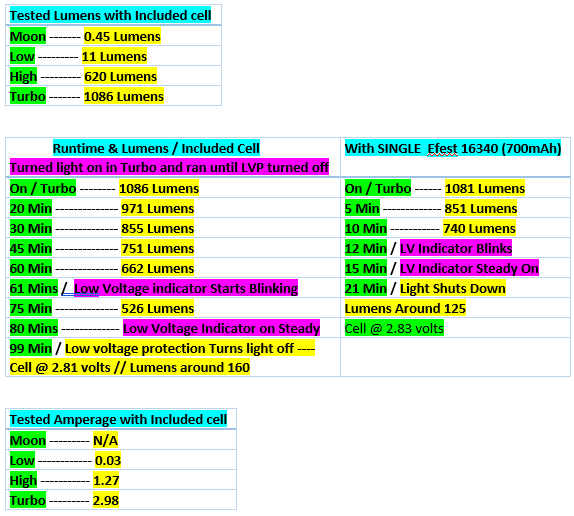 The test I did with the included cell and the 16340 Efest cell are noted in the below chart , as well as my tested lumens and amperage with the included cell. Overall I am very pleased with the newest Neutron 2C V3 for the overall fit , finish , feel and UI and I think ThruNite has a winner with this one. For those who do not want to watch the whole video , the still shots of the light and the beamshots start at 9:19 of the video timeline and the live outdoor footage starts at 13:28 of the timeline. •LED: XP-L V6 with a lifespan of 20+ years of run time. •Working Voltage: 2.7 – 9.0 V.
•Peak Beam Intensity: 14399cd (max). •Max beam distance: 240m (max). •Waterproof to IPX-8 Standard (2meters). •Dimensions: 125 mm in length x 25.4 mm in head diameter. Long press the switch to get firefly mode. When the light is on, long press the side switch to cycle through infinity high and infinity low. Double click from any mode to turbo, another double click to get strobe. The light will turn on in the last mode accessed, except firefly, turbo and strobe. I am kind of surprised this one hasn’t had a lot of attention with the Ramping firmware , upgrades and all. The Big monster lumens lights taking over all the attention now days? Or has it been reviewed to death already that I didn’t see? Hey robo how are you doing man? I kinda feel Thrunite is primarily known for their big guns, especially their monster thrower TN42. Their sub $50 lights are just not discussed here extensively. However at the same time they do have a fan base here. The Neutron 2C V3 is a good example of a solid performing light, but without the mind boggling specs. You really need to have one to truly appreciate it. It reminds me a bit of the Thrunite TN4A; another great performer that just isn’t discussed a lot either. All good points hIKARInoob …….. I kind of feel like the attention now days is mostly on the Big , High output lights also , no matter what brand really. These smaller lights though are the biggest part of what I use personally for 80% of anything I do with flashlights to be honest. Don’t get me wrong , I do have a lot of nice throwers in the collection and I use them when I can or if they are needed , but as I say for most of the normal usage and EDC the Neutron and other lights of similar size (or smaller) just seem a lot more practical. Curious what the length of this is with the 18350/16340 shorty tube? 94mm with the short tube. >> 94mm with the short tube. My 2+ year old 1000lm nitecore HC30 is 98mm w/18650. When is someone going to make a decent NW/WW 18350 light w/reflector that is actually small? Thanks guys for the measurements! Even without your sub-lumen mode requirement being reveled in your post I would have still wanted to make it known there are decent smaller NW reflector18350 lights. The main attraction of the Eagtacs is having XHP emitters and outputs up to 2480lm (1830lm ANSI) from such a small light. Since you’re following the thread I’m sure you’re aware of these Jetbeams, but I thought I’d mention they’re even shorter than the Eagtacs, with low modes of 1.1lm & 5lm, although there’s no NW/WW option. I’m not sure how difficult it would be to swap LED’s on a Jetbeam. The EC-R16 in particular is incredibly small for a reflector light. Does this have the exact same knurling as the TC20? It is pretty darn close……………. Wow nice close up pic. It looks the same to me, does it feel any different? The TC20 knurling is about the best of any light I own, on par with DQG. It prompts me to consider other Thrunites. 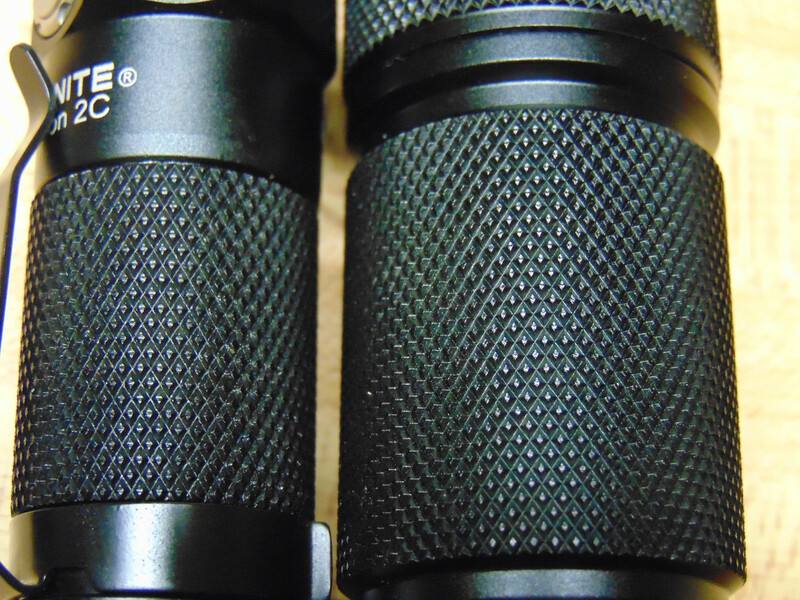 They feel pretty much the same also , like the regular Thrunite knurling usually feels on both really. Something going on with the server on Postimage……heres the charts……….. I wasn’t sure because I don’t see that in the description on Thrunite’s website, It’s probably in the user manual which I think can be downloaded there. EDIT: no user manual downloads there. Not sure why you mentioned in your reply about it not having a tail switch? that was actually a quote from the above review. OK I see, was wondering why you were telling me that! The Neutron 2C is one of the most recommended lights over at reddit/flashlight. Especially to FL newbs. It’s at the top of my wish list right now. I’ve never been to reddit/flashlight, maybe read one or two reviews from there before. I wonder why it’s getting more attention there, and not much here (as robo pointed out)? I don’t know. Maybe just a lot more FL newbs over there from elsewhere on reddit. Pretty huge platform with 40 million user accts.